Supergirl focusses on James who tries to find other ways to be a hero other than beating criminals up at night as Lena and Rhea’s partnership builds to a crucial point. I’ve probably pointed out how little I like the Guardian story in every review of an episode that he appears in so having another episode bringing that to the fore seems like a bad idea in theory. In practice this episode found a really good use for James Olsen while keeping the self righteous Guardian justifications to a minimum. In many ways this episode feels like the writers are acknowledging how problematic turning James into a costumed hero has been and it’s long overdue. We’ve had very little in the way of character development for James this season that hasn’t felt horribly contrived and this episode serves as a reminder of how ill defined he is in general. His interactions with Marcus (Lonnie Chavis) help to give us a sense of who James is as a person. We’ve had hints of how badly the death of his father affected him but it has never been explored to this extent. He mentions that his father was a soldier who just wanted to protect people and he was James’ hero. The word “guardian” is used to describe how James sees him which offers an explanation for the name that is incredibly cheesy but it works because of Mehcad Brooks’ sincere delivery of the sentiment. Thankfully a lot of the focus is on what inspired James to be a photographer rather than a costumed hero. A stroll down memory lane featuring the cameras he has owned over the years is nicely sentimental and shows that James once had a passion for taking photographs. There’s a hint that it could be something that he tries to go back to but it’s unclear based on this episode by itself. I was really impressed by the scenes between James and Marcus. 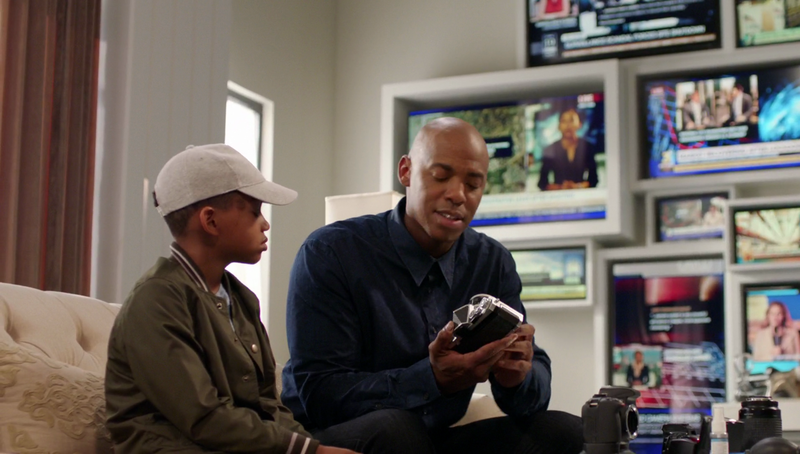 Mehcad Brooks projects something of a fatherly quality in these scenes and Lonnie Chavis does a great job playing Marcus slowly responding to that. The trust between them happens quickly because the bond has to develop over the course of a single episode but it feels gradual and natural considering the circumstances. It’s particularly strong because James isn’t the strong and confident hero who seems to have all of the answers. He comes across as insecure and terrified because of the level of responsibility that he has stumbled into. Marcus has bonded with him so how this is handled comes down to how James behaves and that’s a lot for him to deal with. Beating up criminals in the dead of night wearing a mask is one thing but actually making a meaningful connection that affects someone in a positive way is a really tall order. 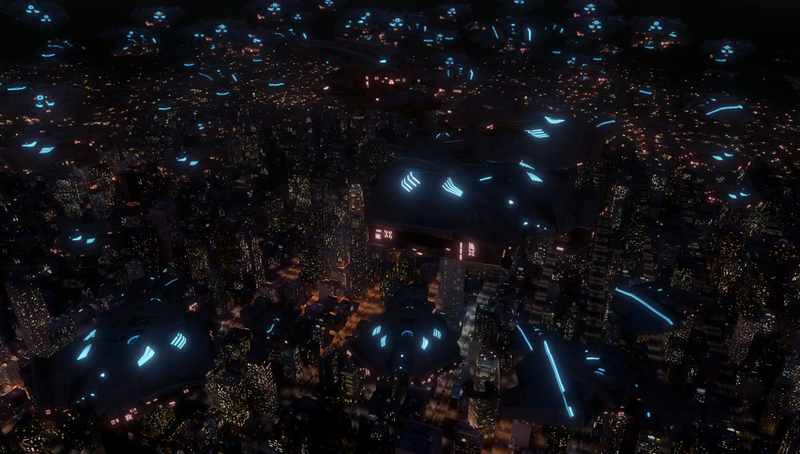 Interestingly the episode doesn’t shy away from the race angle. J’Onn tells James that Marcus is essentially counting on him and James directly asks if it’s because he’s black. It’s hard to deny that this will be part of the connection as this show has always been about developing marginalised groups of people. The role of women in society is an obvious theme that keeps coming up but the role of colour has always been bubbling away in the background. Kara being a woman and James being a black man will have had to deal with unfairly heightened expectations and that definitely plays a part here. James also talks about being young and dealing with racist bullies so he can pretty well understand what Marcus is going through better than Winn ever could for example. J’Onn is outwardly a black man but James’ unique insight into Marcus transcends that race which means that J’Onn is ill equipped to deal with it. For once, James is actually needed. The relationship works so well because each recognises something in the other. Marcus sees a confident and successful black man and that gives him hope for what he could grow up to be. James sees a chance to help a lost little boy who is a lot like he was so the dynamic works wonderfully. Another angle the episode takes on James is him starting to become dissatisfied with life as Guardian. The example used is when a woman he saves runs in terror from him. The dark suit and mask combination is a pretty terrifying image in the dead of night and it’s easy to believe that people might be alarmed by it. James doesn’t like people being scared of him and attributes that to wearing a mask. Amusingly this provides a really overt Batman reference when James compares himself to Clark’s friend who frequently scares people. Winn calls him a “frenemy”. Batman isn’t explicitly named but considering the reference earlier this season it seems pretty clear what the writers are getting at here. Will he ever appear? Maybe not but it’s fun to speculate. This pretty much comes from nowhere as it hasn’t even been hinted at before now but I hope that this dissatisfaction will be developed as I like the idea that James wants to make a difference in the world without terrifying people. This could easily be achieved through his role in the media and I’m sure there are other ways to do it too. One thing is for certain, Guardian isn’t the best way for him to do that and it seems that he’s starting to realise that. The scene where he unmasks to Marcus who stops being afraid of him at that point was really poignant. Hopefully James’ arc will continue along these lines into season 3. Lena and Rhea’s partnership remains as engaging as ever. There’s a very unsubtle mother/daughter dynamic between them that works really well. Lena has always been trying to win her mother’s approval without success and Rhea has had difficulties with Mon’El so there’s a familial gap for both of them that allows them to bond. Rhea gives Lena all the encouragement she needs and Lena responds by simply being grateful to be around her. 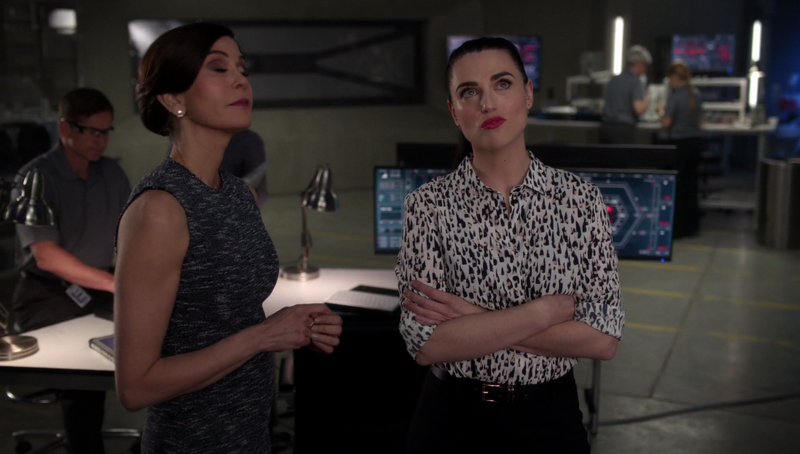 It’s something they both wanted and watching Teri Hatcher bounce off Katie McGrath is delightful. Rhea proves that she is a champion manipulator at various points in the episode. 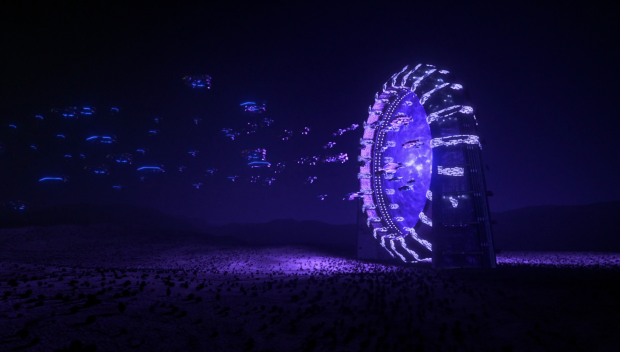 The entire partnership with Lena is designed to use Lena’s resources to build her Stargate portal but even after the betrayal she insists that any affection she showed was genuine. She also tells Mon’El that his father was so upset at Mon’El’s decision to stay on Earth that he took his own life. That’s just dark and Teri Hatcher plays it with melodramatic grief that comes across as somewhat genuine. It’s designed to distract Mon’El and have him blaming himself for his father’s death while Rhea carries on with her plan. The visual of the Daxamite fleet emerging from the Stargate portal was a really striking one and raises the stakes wonderfully for the coming episodes. Whether this will be resolved by the end of next week remains to be seen but the prospect of a full scale Daxamite invasion with Rhea at the front is a really exciting one and should provide some excellent dramatic tension between her and Mon’El. This episode was very Kara lite but it didn’t hurt the plot in any way. She was around enough but none of the scenes were really about her. 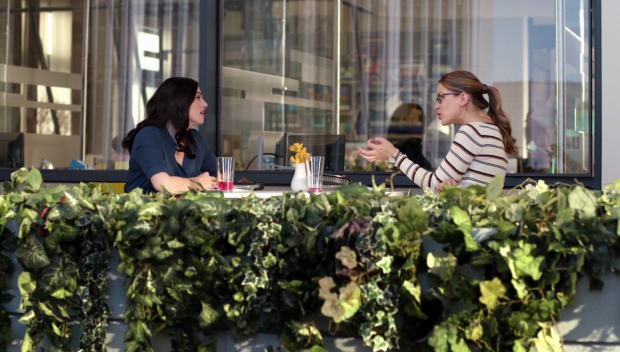 Her conversation with Lena at the start of the episode was about Lena having a “normal” friend to debate celebrity relationships with and any scene after that was either to back up James or Mon’El. There was also very little action which was definitely a good move as it allowed the characters to shine through. An excellent episode that focuses on James outside of his questionable role as Guardian. The bond he develops with Marcus works really well as it allows James to go over what inspired him to be a photographer as well as talk about how he chooses to remember his father. Marcus warms to James so easily because he sees a confident, successful black man that he can live up to and James is reminded of being a lost little boy dealing with racist bullies. It’s a very quickly developed bond but it feels genuine and is well acted. I also like the idea of James being dissatisfied with his role as Guardian because people are scared of a masked figure beating people up in the dead of night. This comes from nowhere but if it puts James on a more engaging arc then I’m all for it. Rhea and Lena’s partnership continues to make for great viewing. It’s an obvious mother/daughter bond and it’s clear what each of them get out of it. Katie McGrath and Teri Hatcher are a delight to watch and I like how brilliant a manipulator Rhea is. She admits to having genuine affection for Lena after the betrayal and telling Mon’El that his father killed himself because he decided to stay on Earth is just cold. The image of the Daxamite fleet invading Earth is really striking and sets things up nicely for next week. Who is this a job for?